Yeddyurappa, the CM candidate for BJP in Karnataka turned 75 and PM Modi visited him from New Delhi to give him Birthday wishes. A huge crowd was gathered in Davanagere to wish Yeddyurappa and people saw Modi by his side. Modi gave a plow to Yeddyurappa as a Birthday Gift. His birthday was marked as Farmer’s meet. There are speculations that Narendra Modi might break his protocol of not giving ministerial positions to the BJP leaders who turn 75. Yeddyurappa knows about this protocol and he speculates his position in Karnataka as the CM if BJP comes to power in the elections which are going to take place in May. The PM has brought an end to all such considerations by announcing that if BJP wins the elections in Karnataka, Yeddyurappa will be appointed as the CM. 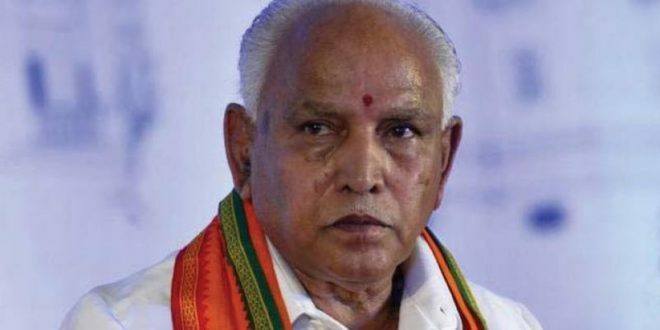 Although, it’s better to be cautious, so the followers of Yeddyurappa have alerted everyone in the party to refrain from mentioning his age in their Birthday Wishes. This includes the former CMs Jagadish Shettar and Sadananda Gowda who greeted Yeddyurappa without writing his age. Union Minister Ananth Kumar took a toll by tweeting wishes to his former mentor by mentioning his age. There have been talks in the party which have worried him but he has dismissed the rumors that the BJP is planning to include him in the Margdarshak Mandal. The opposition party JDS and the Congress have remarked against this declaration of Yeddyurappa being the CM face of BJP by Modi and have gone further to suggest that Modi should make Yeddyurappa a part of the Margdarshak Mandal to stay strong on his rules of barring ministerial positions to leaders turning 75. The political analysts have observed that such a decision by BJP is in accordance with TINA (There Is No Alternative).